Amazon's Dash Button is a forward-thinking device with plenty of potential, but it's very clear that this is the first iteration of a brand new product. When Amazon revealed its Dash Buttons just hours before April Fools’ Day earlier this year, many observers were quick to write the product off as a joke. Just like the parodies that Google has peppered April 1 with in the past, it seemed like a self-deprecating gag about the culture of online shopping. However, the Dash Button is very real. For less than five bucks, Prime members can choose from one of several variants at this very moment. But are we ready for Amazon’s next big thing in retail, and is Amazon ready for us? It’s easy to see the thought process that lead to the Dash Button. Amazon carved out a niche in the 1990s selling books, but soon expanded to make good on the promise of “everything from A to Z” that’s made by the retailer’s logo. Now having become the de facto department store for the digital era, it seems that the grocery store is the next target on Amazon’s hit list. Amazon Fresh is the company’s most focussed attempt to corner this market, but the Dash Button is resolutely part of the same campaign. The Dash Button is designed to be placed in your home. At present, there’s a smattering of different Dash Buttons available, offering products like laundry detergent, bottled water, and even Kraft Macaroni and Cheese. One press of the button, and an order of the desired product will be charged to your card and sent directly to your home. It’s a big jump to go from buying groceries at a supermarket to ordering them online. Whether it’s a weekly shopping ritual or as-and-when visits to a local store, plenty of people enjoy their grocery habits — whether they would admit to it or not. 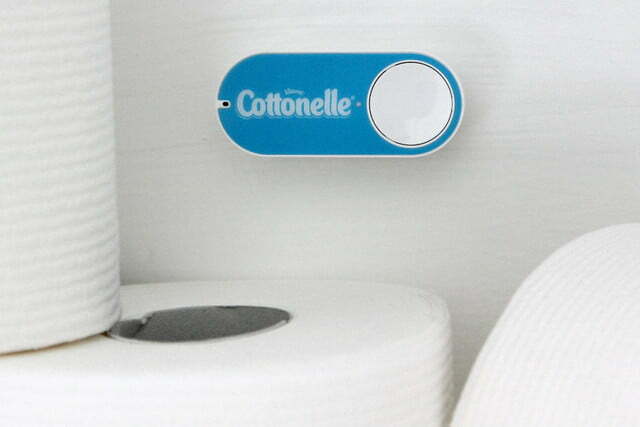 I could never order enough toilet paper to justify the time required to set up the Dash button. Amazon needs a method of convincing people to try out their service, and the Dash Button might be just the gateway device for the job. It’s a major advantage for the fact that it has novelty value. When we look back at visions of the future from the mid 20th century, we see where the roots of the Dash Button lie. It seems that people were quite caught up with ideas of flashing buttons lining every room, and menial tasks like shopping rendered obsolete by computing. There’s the genesis of the Dash Button. It’s the next generation of buying groceries. However, using the device at present demonstrates that the future isn’t as well realized as Amazon might hope. Upon opening a Dash Button, you’ll find the device itself along with some adhesive applicators and a brief instruction guide. The large part of setup relies on a smartphone app, and there lies the beginning of the difficulties you might face. Amazon has clearly tried to make this process as easy as possible, but there are definite kinks to iron out. For one, it demands to be used with specific devices. You would think that you’d be able to carry out set-up on your computer, but it’s app only. In my experience, that proved to be quite a restriction. The Amazon Shopping app on my iPad contained zero reference to the Dash Button, even though it otherwise seemed to be the correct piece of software for the job. It’s difficult to establish whether this is a quirk of my device in particular, or if it’s connected to the way the Dash Button communicates with the device in question via ultrasonic sound during setup. Once I did manage to find an app that contained the menu item I was looking for, I could tell both the Dash Button and the phone to start looking for one another. Unfortunately, that never happened, and the backup plan that the app offered up was also a total failure. It was somewhere in this process of attempting to connect, failing to do so, searching for help online, and repeating that process that I began to question the very basis of the Dash Button. I had purchased the variety that offers up a package of Cottonelle toilet roll, to my mind a good thing to be able to order easily. However, in the time I had spent trying to set up the button itself, I could already have been back and forth to the nearest shop on foot and bought any amount of toilet paper. For the time I had invested, I would need there to be a considerable number of toilet roll orders via Amazon in my future. The Dash Button, in its current form, can only offer utility in the most specific cases. To the vast majority of people, it’s a novelty that serves absolutely no practical purpose. Despite this, it’s not a total failure. This is an early iteration of a service that might hold more value, soon. Shopping from the comfort of your computer or smartphone, even for the most mundane items, could be the future. Amazon’s button could do more to advance this cause, but it’s an important first step. The problem with a product like the Dash Button is that it needs to be thoroughly tested. Its function interrupts the standard supermarket gathering procedure that’s been in place in our culture for decades. People will only switch if the experience is absolutely smooth. Unfortunately, there’s evidence that the Dash Button is a work in progress everywhere you look. We’re already inundated with advertising on a minute-by-minute basis. For example, consider the branding of each button. It makes sense to emblazon a Dash Button that serves up toilet roll with the Cottonelle logo, because that’s what you’re buying. However, something that looks fine on an Amazon product page can look completely out of place in a home. We’re already inundated with advertising on a minute-by-minute basis. Branding allows companies to advertise to us subtly, familiarizing us with logos and color schemes in an attempt to attain a purchase when we’re shopping later on. Willingly mounting a branded button on a wall in your home feels like offering yourself up to the gods of consumerism, and it’s unpleasant. Furthermore, Amazon recommends that you place these buttons where individual products are kept, for easy restocking. The thought of having these tiny one-button shops littered around my house, waiting for me to make a purchase, is unsettling. There’s a marked difference between being able to shop from the convenience of your home, and allowing your home to turn into a shop. The current Dash Button veers too close to the latter for comfort. A product like the Dash Button needs to spend some time in real homes of real users before it finds its true identity. It makes complete sense that the first iteration caters to Amazon’s needs better than the user’s, because it came from among their ranks. Moreover, there’s the fact that individuals tend to shop differently. Some people might really like Amazon’s suggestion that your detergent Dash Button should be placed right next to your washing machine, so that as soon as you find that you’re out, you can re-order. I found I’d much prefer it to be hidden away, and if I ended up with several, I’d want them to be grouped together. A small panel of Dash Buttons tucked away inside a cupboard or round a seldom-viewed corner of a pantry removes much of the invasive nature of the product. In fact, there’s a certain Batcave-like appeal to a set of controls tucked out of sight that can instantly order household goods and snacks. It’s tough to recommend the Dash Button in its current state, but using it gave the impression it’s something to watch out for in the future. If this first run of devices is intended to be a real-world beta test, then it certainly bodes well for what the second generation holds.